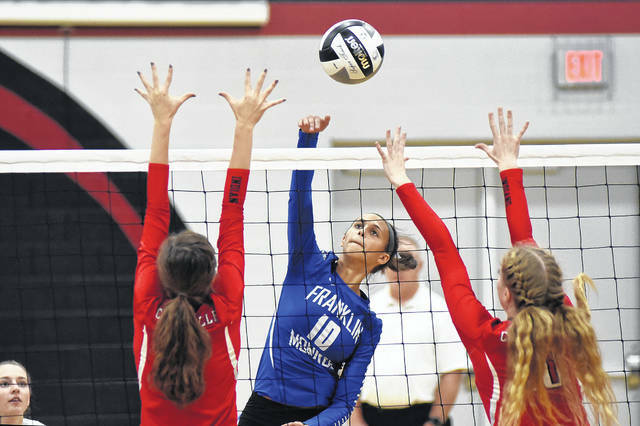 Franklin-Monroe junior Corina Conley (10) gets a kill against Cedarville on Wednesday night in the Division IV sectional tournament at Covington. The Lady Jets swept Cedarville in three sets to win the match and advance to the next round of the tournament at 5 p.m. on Saturday against Houston. 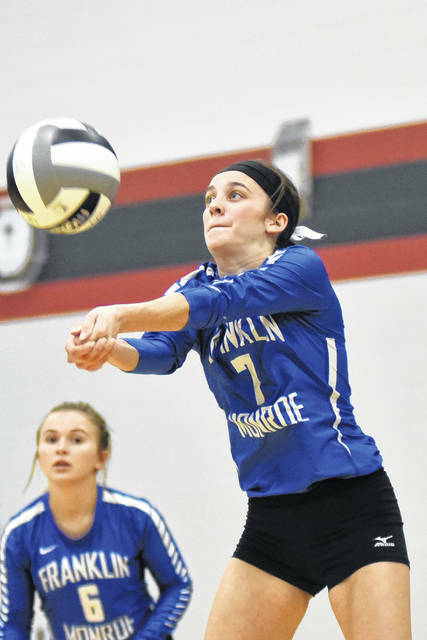 Franklin-Monroe senior Brigette Filbrun (7) gets a dig against Cedarville on Wednesday night in the Division IV sectional tournament at Covington. The Lady Jets swept Cedarville in three sets to win the match and advance to the next round of the tournament at 5 p.m. on Saturday against Houston. 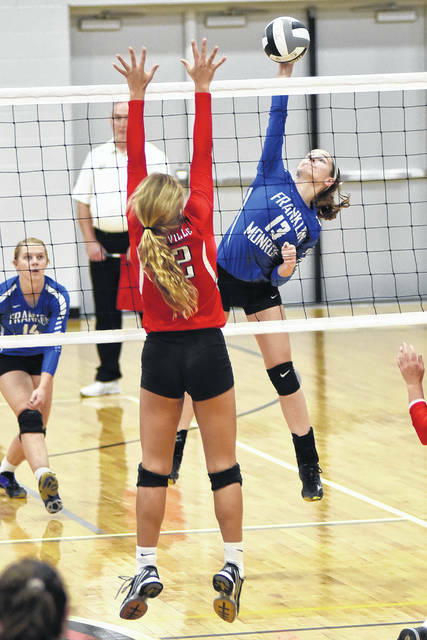 Franklin-Monroe sophomore Chloe McGlinch (13) gets a kill against Cedarville on Wednesday night in the Division IV sectional tournament at Covington. The Lady Jets swept Cedarville in three sets to win the match and advance to the next round of the tournament at 5 p.m. on Saturday against Houston. 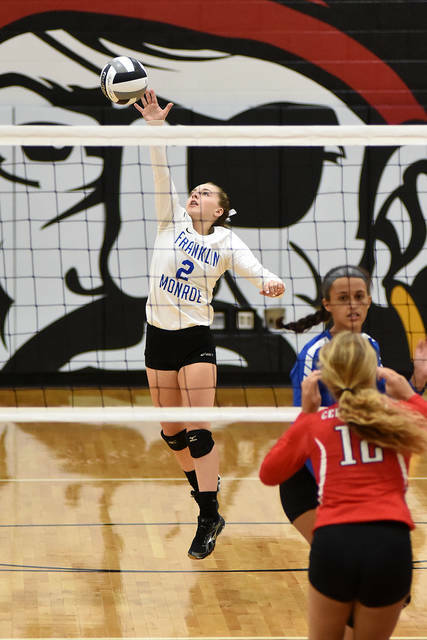 Franklin-Monroe senior Kennedy Morris (8) sets the ball up for a teammate against Cedarville on Wednesday night in the Division IV sectional tournament at Covington. The Lady Jets swept Cedarville in three sets to win the match and advance to the next round of the tournament at 5 p.m. on Saturday against Houston. COVINGTON – Franklin-Monroe junior Corina Conley was pretty proud of her teammates Wednesday night. 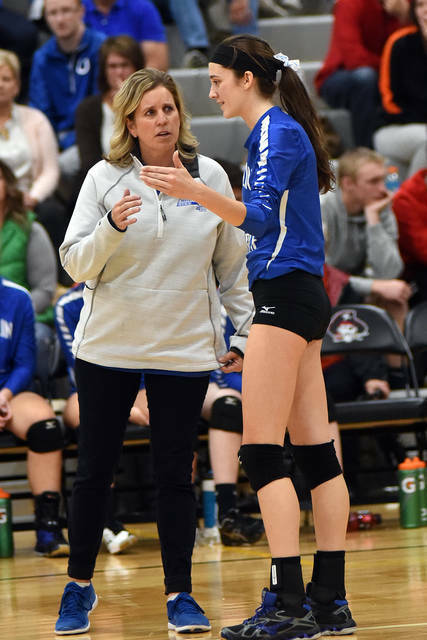 The Lady Jets shrugged off any lingering thoughts of a disappointing start to last year’s sectional tournament by defeating Cedarville in three straight sets 25-18, 25-15, 25-14 in the Division IV sectional tournament at Covington. F-M had a record-breaking season a year ago entering the tournament with a 20-2 record and facing Sidney Lehman Catholic in the first round. 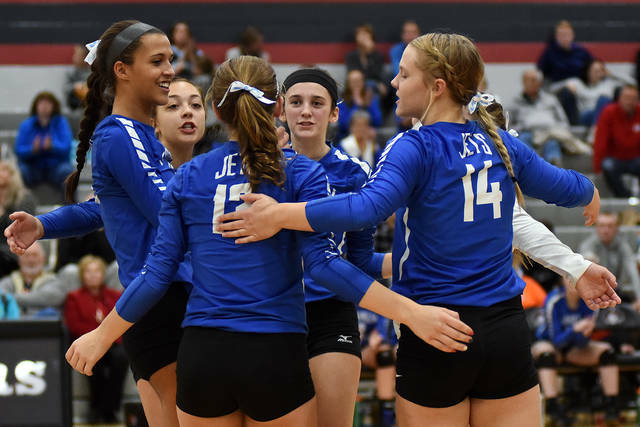 But Lehman upended the Lady Jets in five sets spoiling what could have been. The first set with Cedarville started a little slow for the Lady Jets as well. F-M never got more than a three-point lead on Cedarville until an ace by Chloe McGlinch pushed her team to a 15-12 lead. They pushed forward from that to spot on a 10-5 run to close out the first set, 25-18. 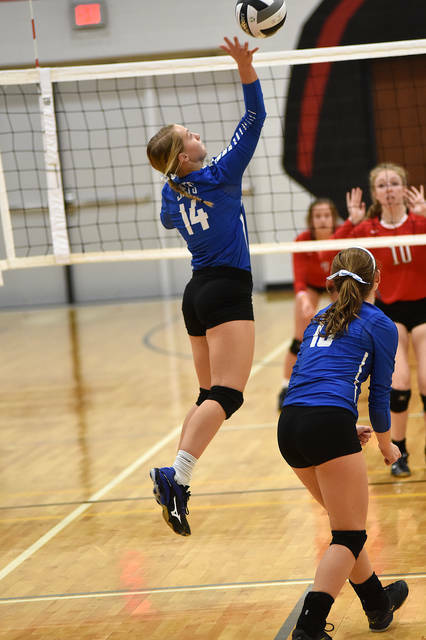 It was the closest margin of victory the Lady Jets would have the rest of the night taking sets two and three by scores of 25-15 and 25-14. “I am excited,” FMHS coach Angie Filbrun said. “We started the second season off right with a win. It wasn’t probably our best, but we survived and we’re moving on. I think we had some nerves in that first set, but we just had to take a deep breath, calm down a little bit and realize we needed to go out and play our game and we did. 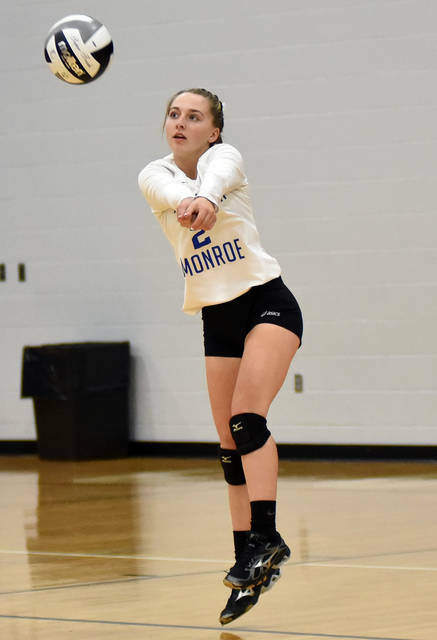 In addition to Conley’s 10 kills, McGlinch had 9 kills and 4 aces, Kloe Zink had 8 kills and 2 blocks, Chloe Peters had 6 kills, Brigette Filbrun had 15 digs and 18 assists, Kennedy Morris had 13 digs and 13 assists and Belle Cable also had 13 digs. 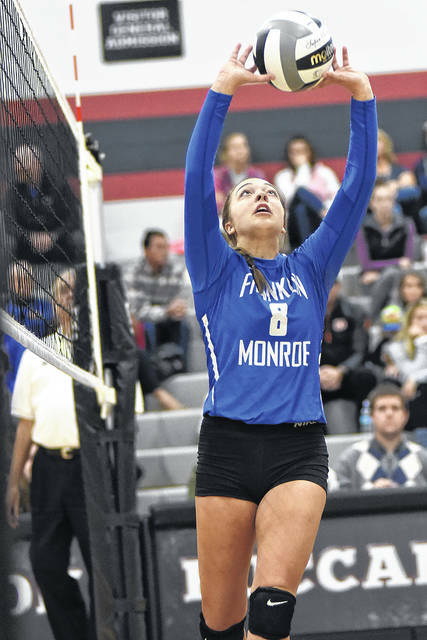 Franklin-Monroe advances to the next round to face Houston at 5 p.m. on Saturday at Covington. The Lady Jets beat Houston during the regular season. This entry was tagged Angie Filbrun, Brigette Filbrun, CCC, Chloe McGlinch, Corina Conley, Franklin-Monroe volleyball, Kennedy Morris, Lady Jets, SWDAB. Bookmark the permalink.